I love the East Coast trains as they have great service from Leeds to London and their first class is also great and very reasonably priced when booked in advance. They are currently having an awesome sale with tickets starting at £5 between Leeds/York and London for a standard class and £20 for first class travel. You can book tickets with this sale until the 9th of January for travel up to 27th of March. They do have some black out dates on 13-22 of February and 28th of February to the 7th of March. 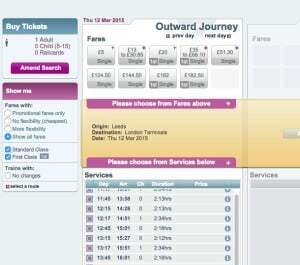 I did check the 12th of March for tickets to London from Leeds and the offer showed properly. Standard class was £5 and First Class was £20 per person. The price is also the same from York to London and vice versa which makes it a great destination to visit historic York for a weekend. Here is the small print for this offer. For travel on East Coast trains only, from 17/01/15 to 27/03/15, excluding 13-22 February (inclusive), 28 February and 7 March. Book by 23:59 on 9 January only at eastcoast.co.uk/bigsale. At least 150,000 Standard & 50,000 First Class fares will be made available for across the travel period and are subject to availability. Limited availability on peak services. No other offers or discounts can be applied, including Railcards or child discounts. Travel on booked trains only. No changes, no refunds and no break of journey permitted.